Harley Davidson Boots - Top 10 Picks! Here is a look at the ten best Harley Davidson boots. 1. The Men’s Trail Boss is stylish and functional. The rubber sole is oil resistant and the cushioned sock lining make these a comfortable fit for any biker. 2. 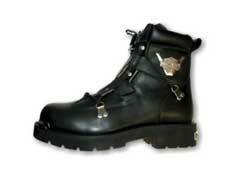 Harley Davidson boots come in a wide variety of styles to suit your design tastes. This is best illustrated by their El Paso Boots, which projects a southwestern design while providing the comfort and durability all Harley Davidson boots provide. 3. The Men’s Stealth boots are made with Tech Tuff overlays, which is an abrasion resistant material. As a result, bikers will love how low maintenance these are. 4. The Men’s Hustin Waterproof Boots are functional and comfortable. They are made with a Goodyear welt construction that will keep your feet dry in wet conditions. 5. The Men’s Riddick Boots combine many of Harley Davidson’s innovative features to make this the perfect footwear for bikers. Along with the sock lining, Goodyear welt construction and YKK locking inside zipper, these come with Poron ankle protection. If you are serious about having the best gear these boots are the ones to buy. 6. Another good option is the Men’s Lynx Boots. These are made for the long term use as they have a Vibram rubber outsole. 7. Women will also enjoy Harley Davidson boots as there is a wide selection of styles. The Women’s Kat Boots have a rugged design and feature a rubber mini lug outsole as well as a cushioned sock liner that will keep your feet comfortable. 8. Harley Davidson women’s boots are also functional. The Women’s Hennie Waterproof Boots exemplify this by their cement construction that will hold up to a wide variety of elements and the waterproof full grain leather material will keep your feet dry. 9. Women’s Stealth Boots are both stylish and comfortable. They come with many benefits that will keep them looking sharp while protecting you for the long haul. 10. The last to make the list is the Women’s Auburn Boots. These come in both brown and black to suit your design tastes. Best of all, they are visually appealing and have many of the comfort features like a cushioned sock liner, that will keep you comfortable.